Rocky Mountain National Park offers over 250,000 acres of breathtaking scenery to make backpacking trips and fly fishing vacations into an unforgettable experience. Rocky Mountain National Park meticulously maintains all trails, and there is even access to rugged backcountry routes with isolated sites. We can guide you deep into the backcountry, explore remote, high mountain lakes and streams, where fish thrive and wildlife is abundant. 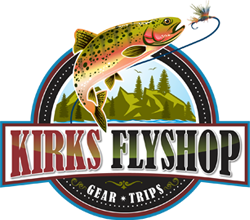 Kirk’s Flyshop will completely tailor Colorado fishing trips to each angler’s preference. We will take into account distance, destination, and backpacking ability. Some of our favorite backcountry/fly fishing routes include trekking over the Continental Divide, fly fishing along the way, hiking to the remote Hutcheson Lakes, or fishing for the Native Greenback Cutthroat Trout in Thunder Lake. Call Kirks Fly Shop to learn more about these fantastic destinations or to find out more about other spectacular backcountry routes. All equipment included (backpacking & fly fishing). All food is included. Your guide will set up camp for you and prepare all of your meals. Don’t miss this once in a lifetime opportunity to fish legendary trout waters. Call (877) 669-1859 to Reserve your RMNP Backpack/Fly Fishing Trip, or call or fill out the form on the right for more information or questions.